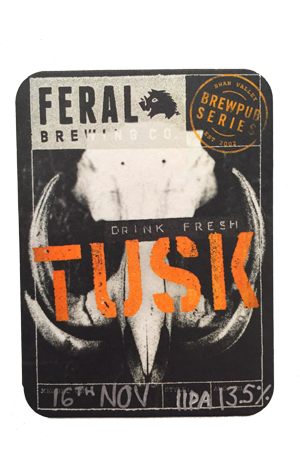 What began in 2003 as a high ABV beer with no dry hopping has, in recent years, become an incredibly hyped beer that, twice a year, Feral have used to spread the message of the importance of freshness in beer as well as the cold chain when it comes to logistics. Sampling spring 2018’s release, the brewery's biggest iteration yet, an hour after the beer was kegged off, there's no doubt that it delivers on this promise. And then some. Pineapple and papaya are most evident with a wisp of mandarin peel that hides behind a coating of increasing warm alcohol that hints a pleasant white pepper-like prickle. At 13.5 percent ABV, the booze is unavoidable and could be a hot mess; however, Tusk Spring 2018 retains an incredible poise thanks in part to a dryness that erases the initial malt sweetness, replacing it with a surprising lightness for a beer of such stature, along with an integrated resin that helps anchor proceedings. Make no mistake, this is a big beer – a pint sits at 6.4 standard drinks – yet it’s also a masterful exercise in brewing technique, something which may be lost in the fervour that goes into trying to taste the elusive beast during its evanescent appearance at venues around the country.